Well, it's been a while. 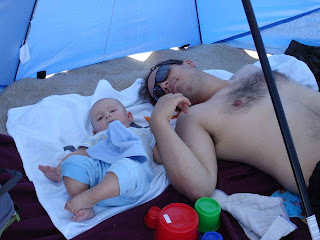 And the reason for that is that we have been quite happily occupied visiting with family in favorite places. 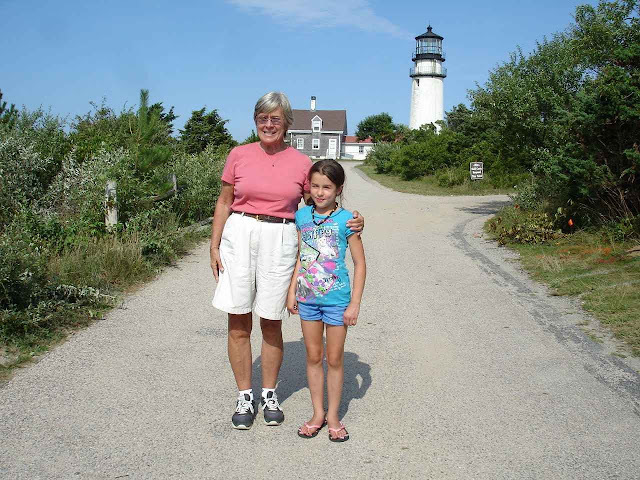 WARNING: This post has a number of family pictures , but you might want to scan through for pictures of the Truro and Provincetown area , Cape Cod. 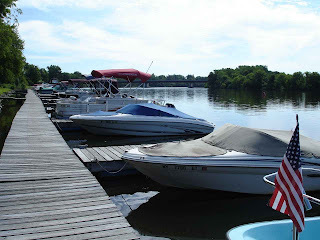 Heading for New England, we made a stop at Arrowhead Marina in Glenville , New York near Schenectady. The campground is well maintained on the Mohawk River. Always an enjoyable stopover. 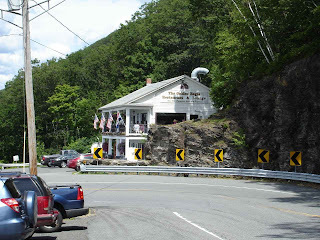 For this trip we decided to head out on Route 2 through Troy and on to the Mohawk Trail. Heading out of North Adams, Mass. it has one hairpin turn. the restaurant on the curve is still just as popular as in years past. Probably because of the view--maybe for the food too? Since Lady Blue is self contained, we happily accepted an invitation to park in the driveway of Scott, Rachel, and Lucas. Lucas is happy to see Grandma again. Well, at least we think so. 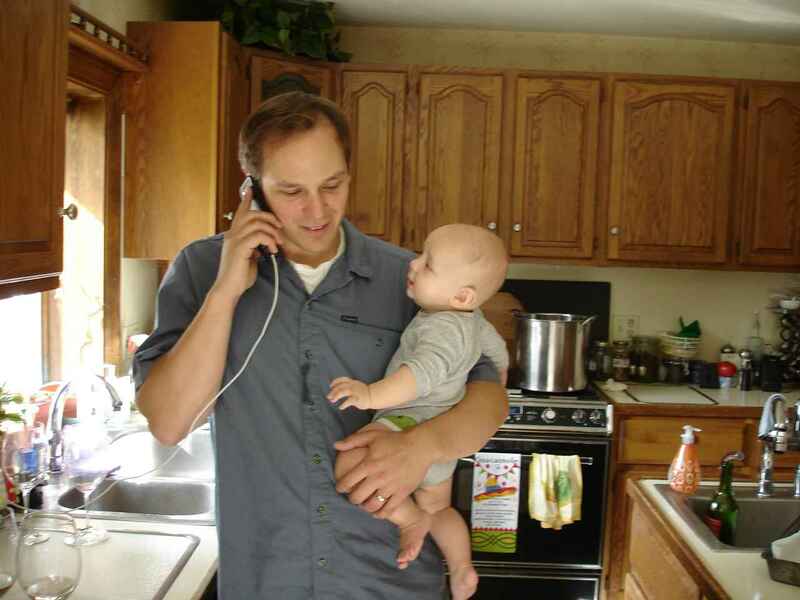 Say, Dad, want to hand me that phone. How about one of my own soon? 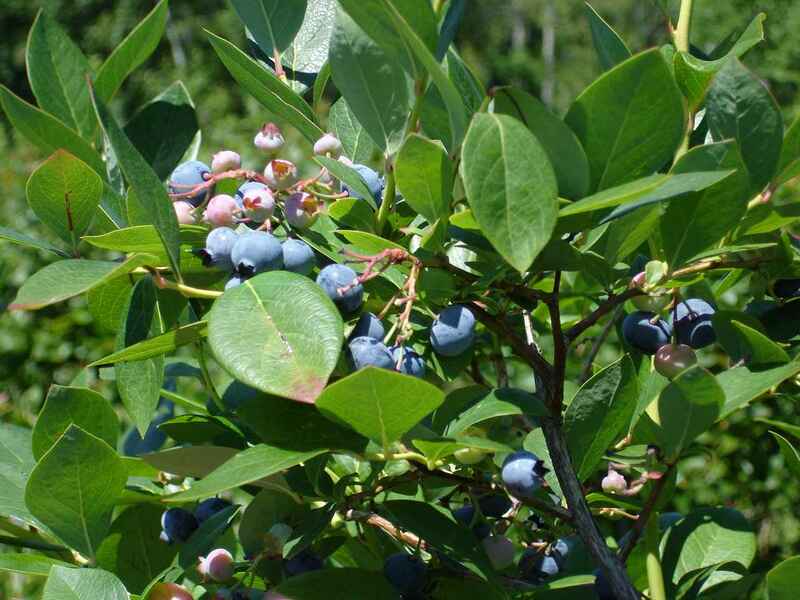 Next morning Mom and Dad are off to work, but they suggest a great stop at Westward Orchards for a little blueberry picking. 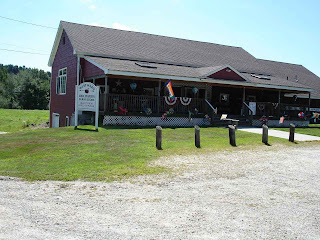 Great stop also for fresh cider donuts and other goodies. 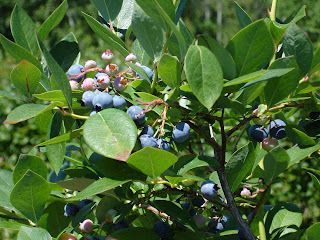 The bushes were loaded with blueberries. Almost seemed like cheating, it was so easy. Nope, that didn't stop us at all. 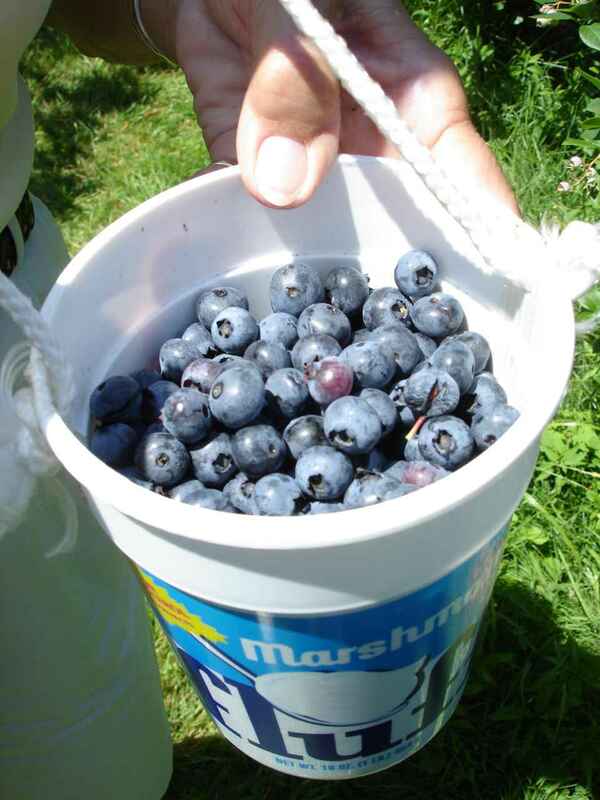 What a great idea for picking. They had a number of these old Marshmallow Fluff containers with a loop to hang around your neck. 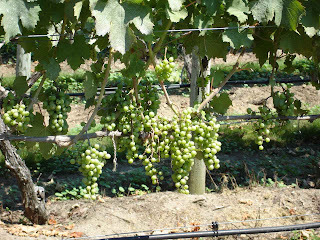 Two hands free for picking. Great! 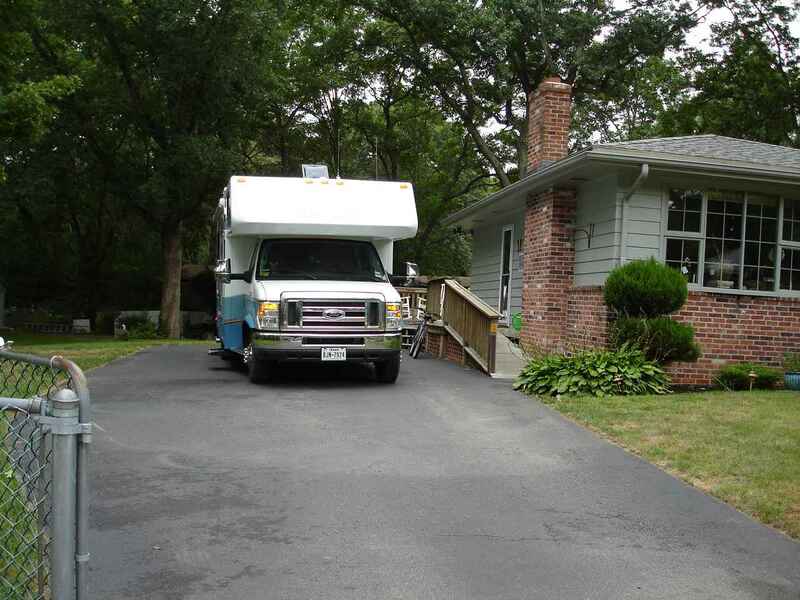 Another great driveway stop to visit Gary, Patty, and Emilie. A nice big yard and tasty hamburgers,corn, and pasta salad out on the grill. 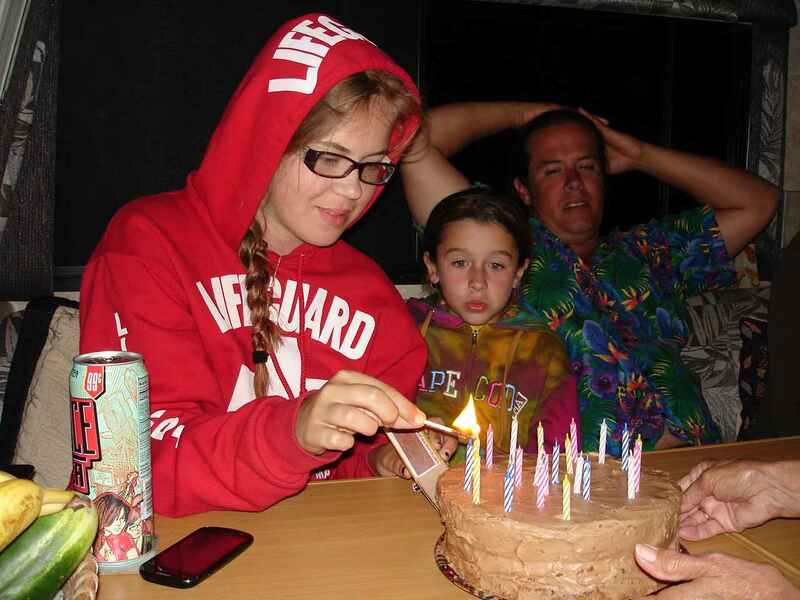 Even a good campfire in the back yard thanks to Emilie. 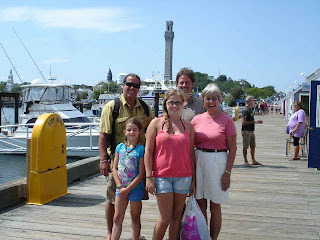 After this, we had a great visit with Richard and Gail Ashcroft--great lobster salad, marinated mussels, and Somerset Creamery ice cream over brownies on the porch. 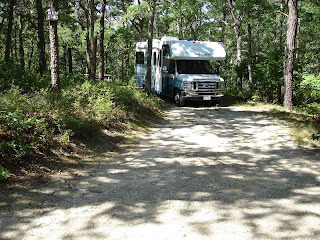 Since our destination is Cape Cod and our reservation cannot begin until Saturday, we decided to make a reservation for two nights Thursday and Friday , at Shawme Crowell State Forest in Sandwich, Mass. 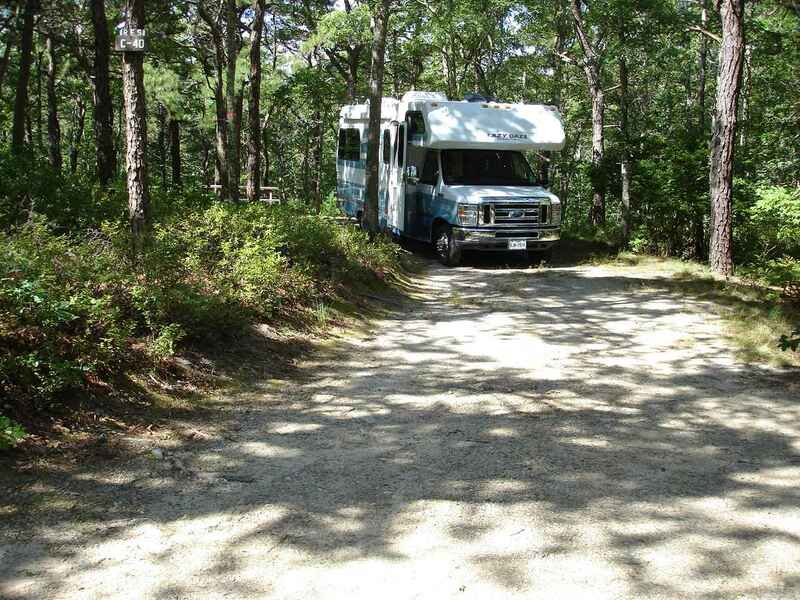 That is a nice quiet campground with large separated sites just over the Sagamore Bridge. 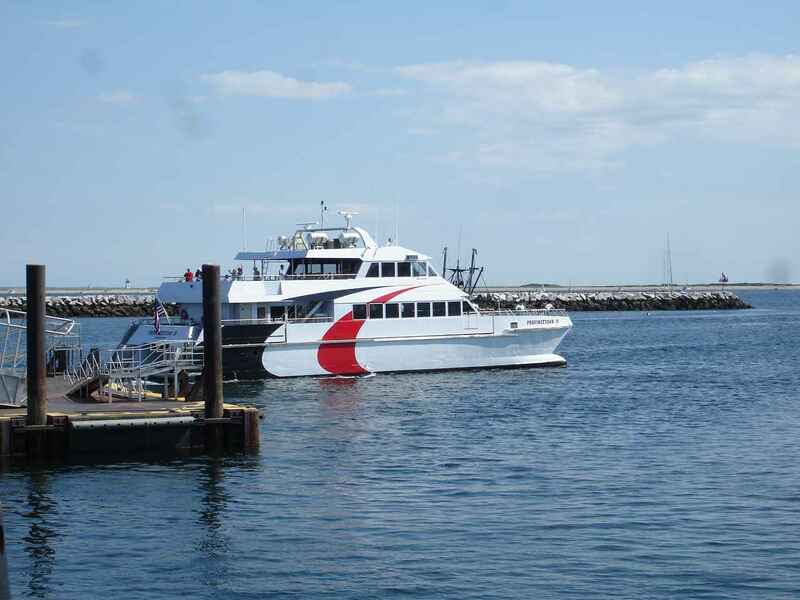 Thus, we eliminate any traffic jams leading to Cape Cod on Saturday. Doesn't take long for Jan and Gary to get comfortable on the beach visiting with family. You folks been here before?? 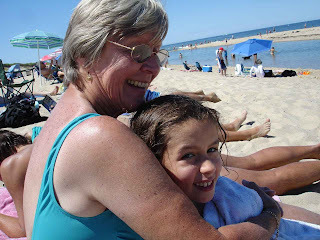 Sometimes it is nice to have a little Grammie time. 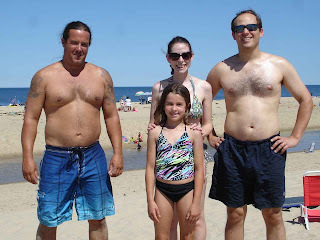 The beach was unusual this year. In the distance is the normal ocean beach with nice clear water and waves. 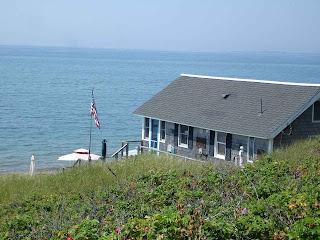 The wild storms over the past winter formed an inlet between the beach and the ocean. Great for jumping at high tide. Click on the arrow to play. Jan loves using the oven in Lady Blue. And one great use is making a double decker hot milk sponge cake with mocha frosting for two birthdays. Happy birthday Emilie and Madison!!! Yes, each girl had her own candles. 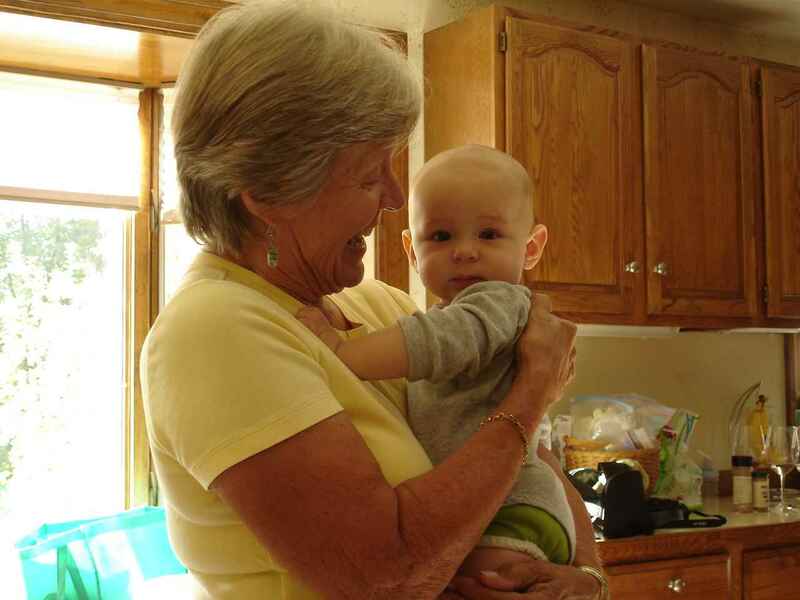 Relax Dad, Grammie has it covered. What to do besides the beach? 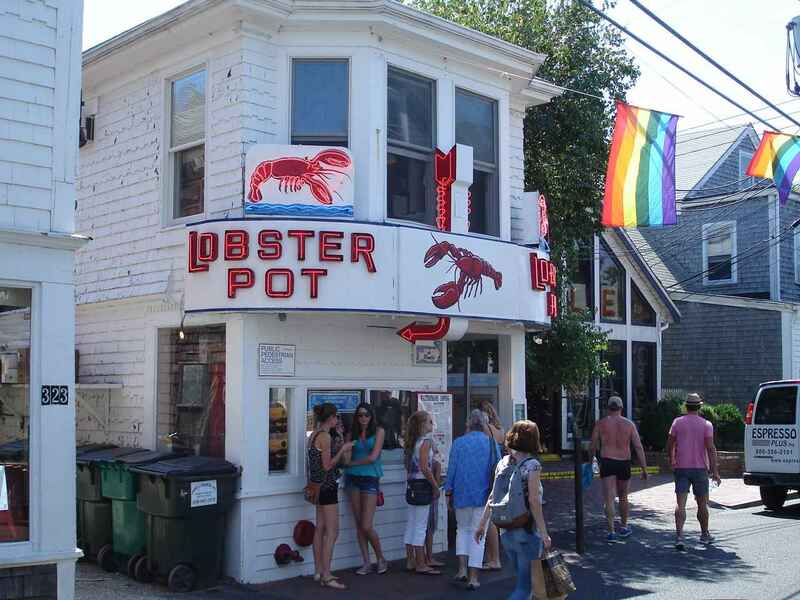 The vote is for a visit to Provincetown. 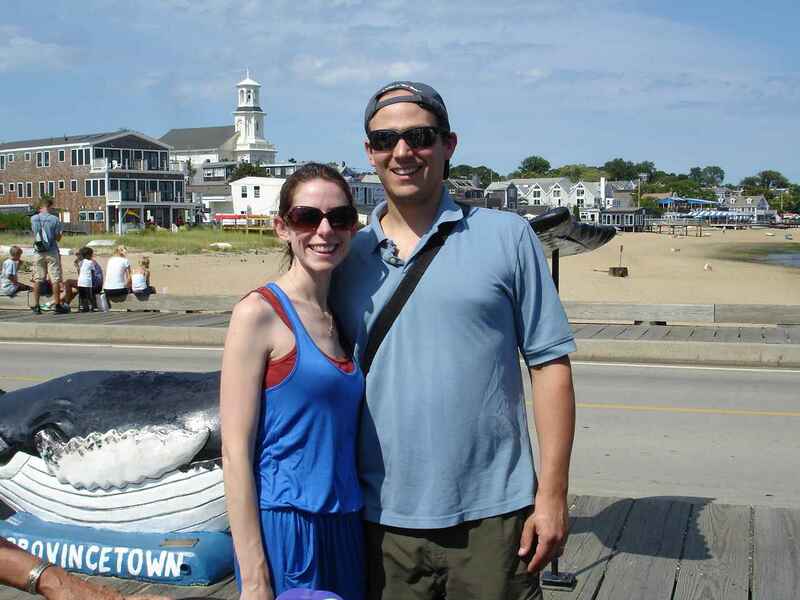 Gary and Emilie are happy to give us a smiley picture on the Ptown wharf. 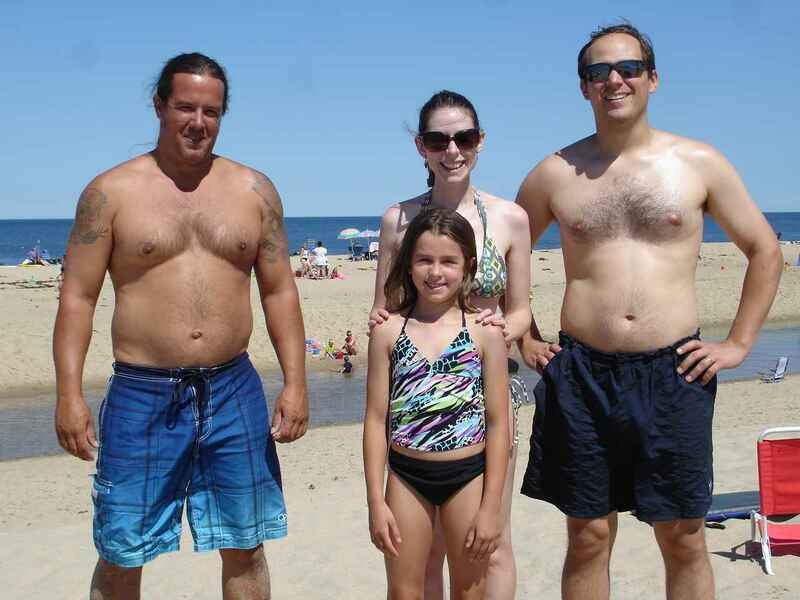 Cousins don't get enough time to visit each year. Always a great time when they do get together. Getting everyone together for a picture is difficult. 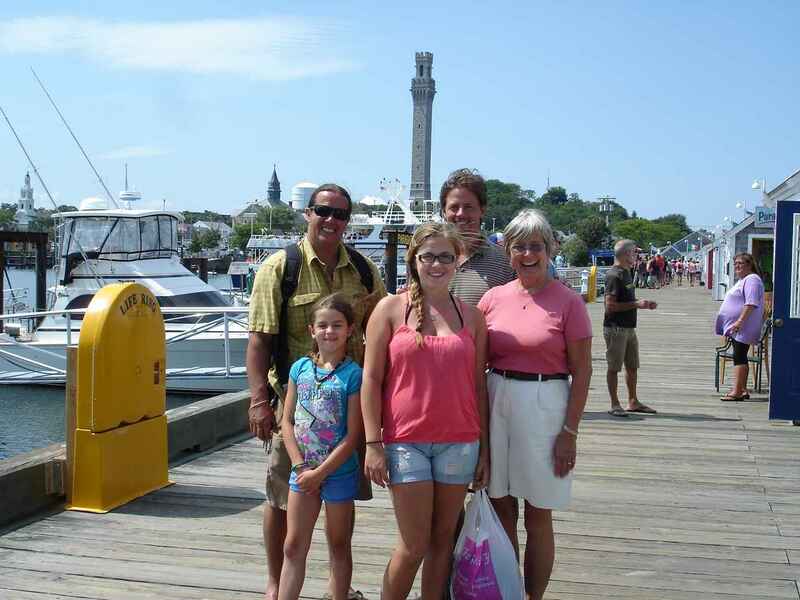 Here we have Jan, 2 sons, and 2 grandchildren. Missing from this picture is one more son, a few daughters-in-law, a son-in-law,a daughter, and a grandson. How about photoshop? See you soon--Alison and Keith. 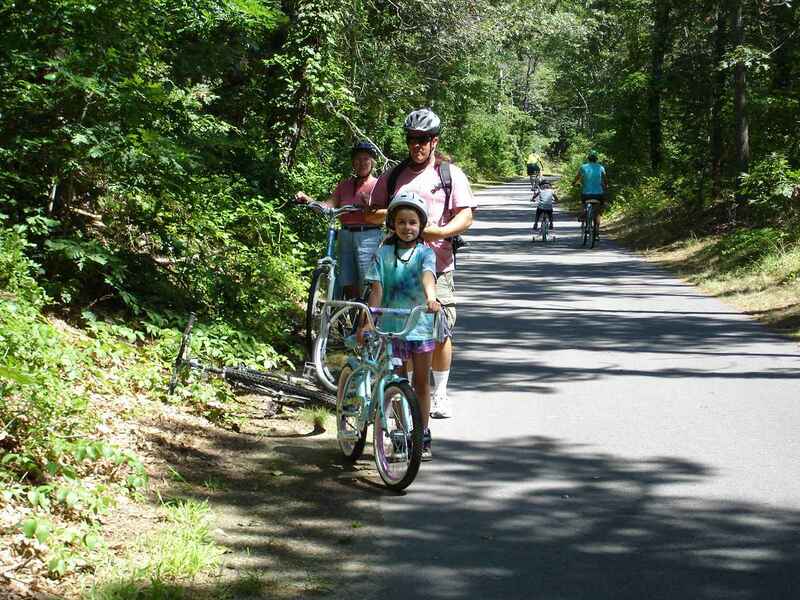 One of the big attractions for Cape Cod is the Cape Cod Rail Trail. It is a full 22 miles from Wellfleet to Dennis and you can add a spur to Chatham as well. 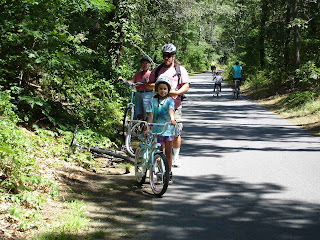 Madison wore out her Grandma and Grandpa with a first ride of 28 miles(out and back). 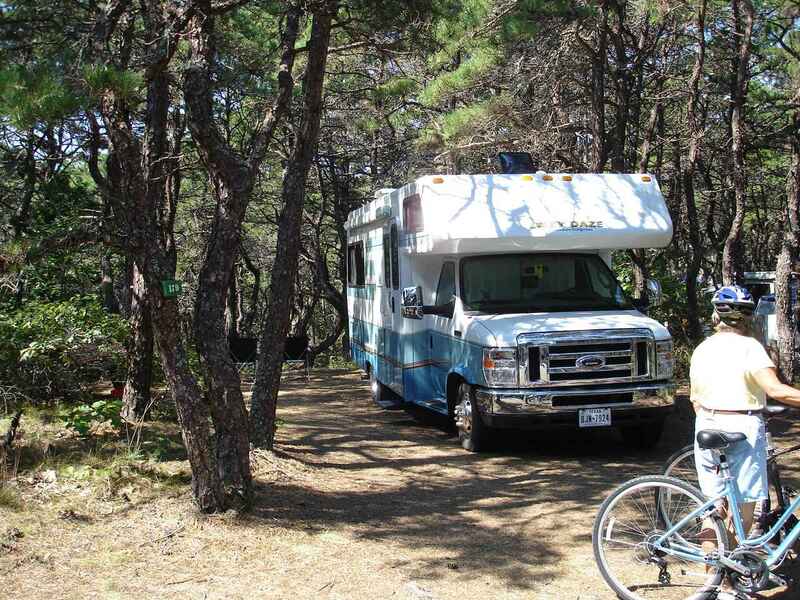 Gary and Emilie could only stay for one night. Maybe more next year? Scott, Rachel, and Lucas decided to give camping a try for three nights---brave! Lucas says he's ready! Mom and Dad look ready! 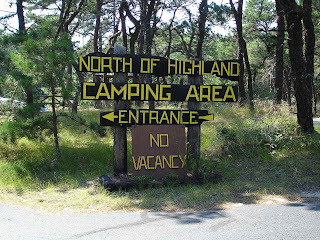 We've camped at North of Highland Campground in North Truro(at the end of Cape Cod) for 44 years. It is basically a tenting campground with 237 sites and no hookups (dry camping). 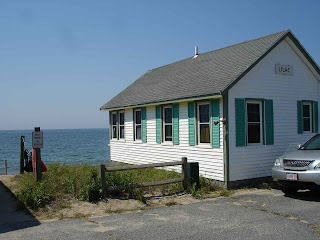 Opened in 1954, it was established well before the Cape Cod National Seashore which surrounds it. Besides its friendly family atmosphere, it is located such that you can walk for about 10 to 15 minutes down a sand path to a great ocean beach., Head of the Meadow. 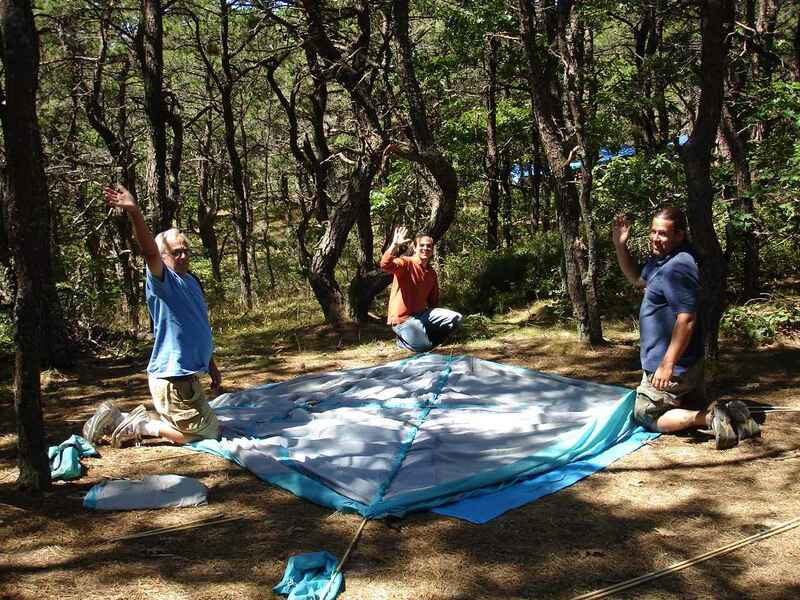 This tent looks like an easy put together. Hey Gramps, do you actually know how to put one of these together? 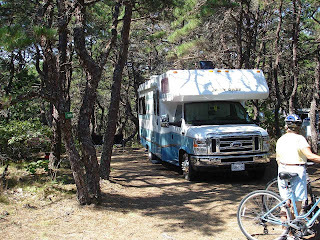 Lady Blue fits nicely in a regular spot--no hookups , but plenty of room. Much better Grandpa, let the Dads set up the tent, you spend some great time with Lucas. 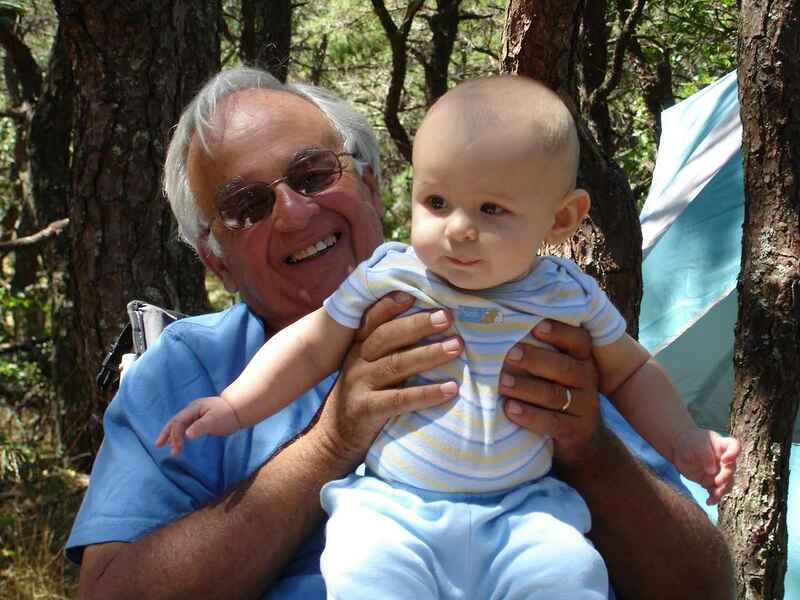 Don't worry Lucas, Grandpa won't drop you. 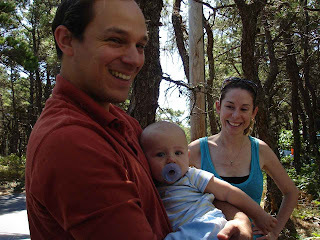 Lucas and Mom and Dad had a great first camping experience. Okay, ready for the beach. But, is the beach ready for us??? We know it's naptime under the umbrella. 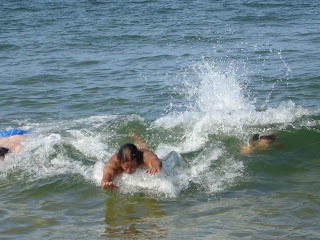 A favorite Maggs activity is body surfing--catching a wave and riding it in to shore with just yourself--no board. Time for another visit to Provincetown. Even with some modern additions, this small town still shows it roots as a fishing village on the tip of the Cape. 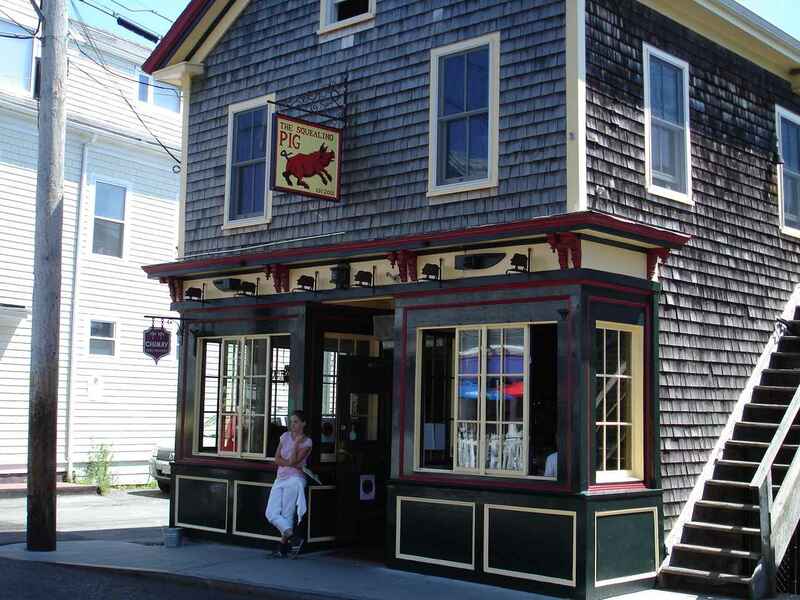 You can see some of the old flavor with a look down Commercial Street. Some of the classic buildings include the library sporting the cupola in the background. 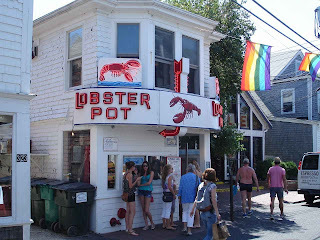 For many visitors to Provincetown, the visit is not complete without a stop at the Lobster Pot Restaurant. 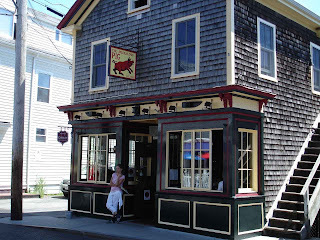 It is located on Commercial Street close to the corner leading to the main wharf. 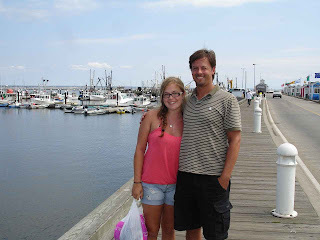 Big smiles on the Ptown wharf. 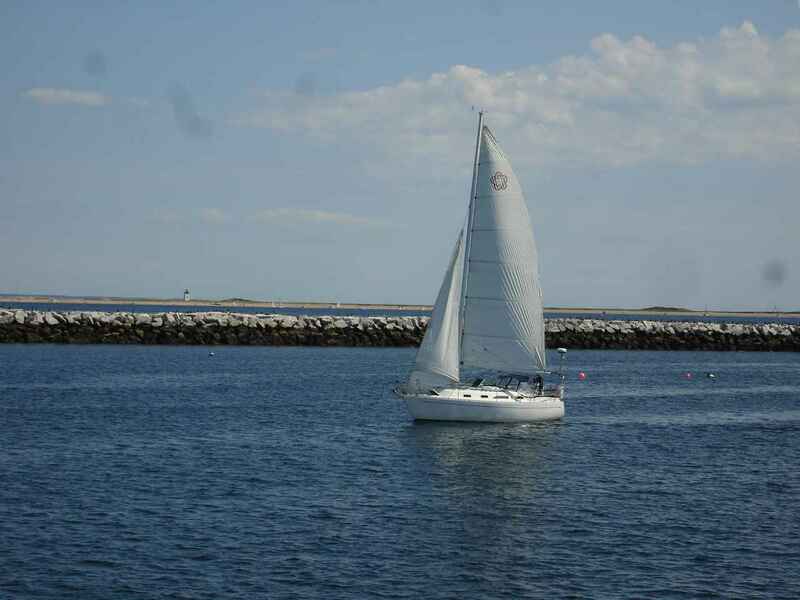 How could you not like a sunny day in a beautiful spot.? 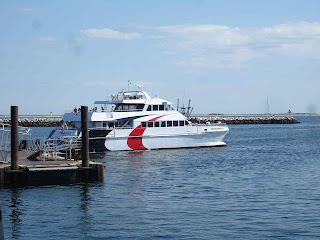 One of the best connections to Provincetown is the fast ferry that travels from Boston to Ptown. 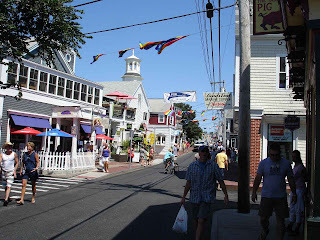 Above is a typical sight from the wharf in Ptown. In the distance is Long Point light which is at the very tip of the Cape. 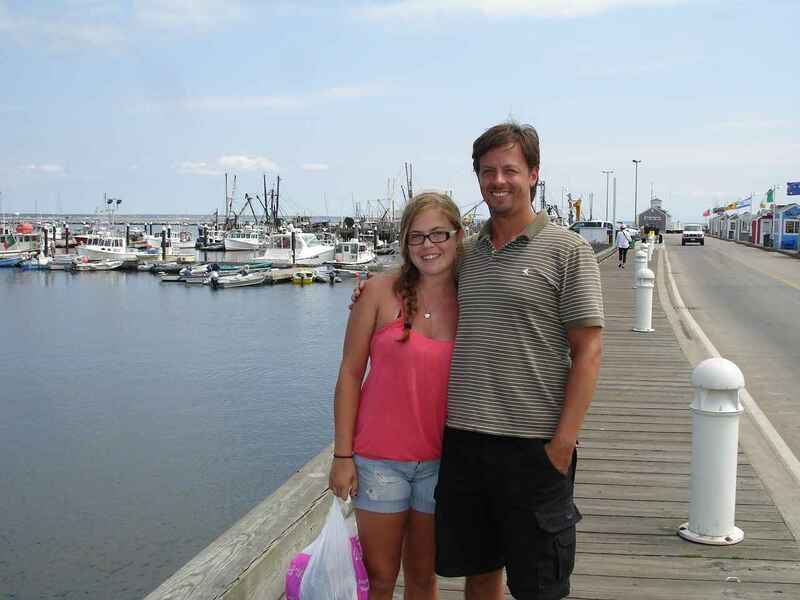 This is from the Bay side at Beach Point. 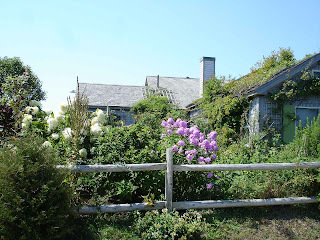 It is the Lilac cottage from Day's Cottages, an iconic view of this part of Cape Cod. 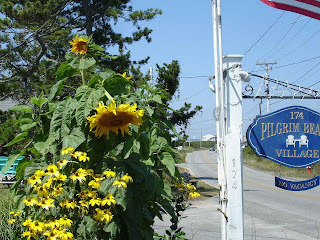 It's sunflower season--lots of gardens in this part of the Cape. 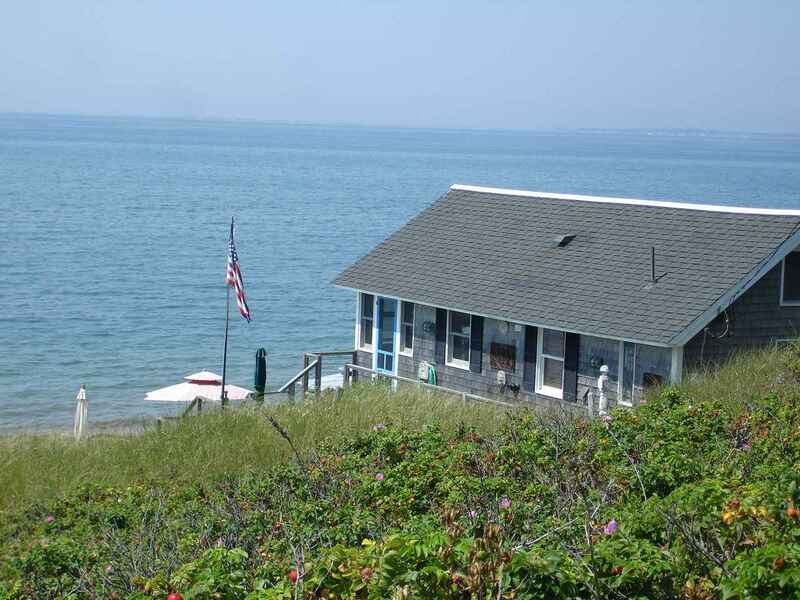 A pretty cottage above the beach on bayside. We sometimes get a chance to talk to these owners and compliment them on their gardens. They are in bloom from Spring into Fall. 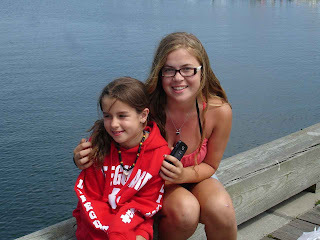 We always have to stop at Cold Storage Beach. This is a beach where fishing boats used to moor off the beach and pulley the fish in to cold storage buildings on the shore. It is also where Truro Recreation used to have swimming classes in the summer and where our kids learned to swim in the summer. Next stop is Truro Vineyards. 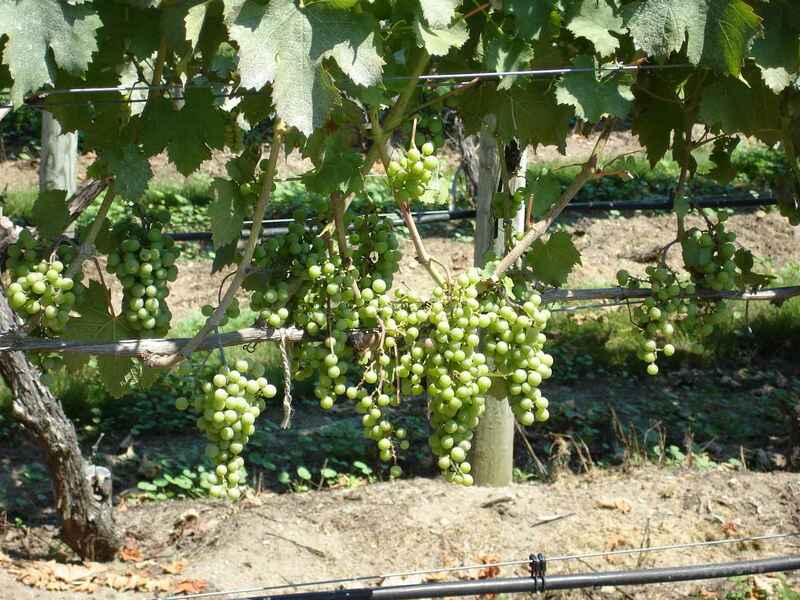 These are Cabernet Franc grapes--pretty close to ripe . 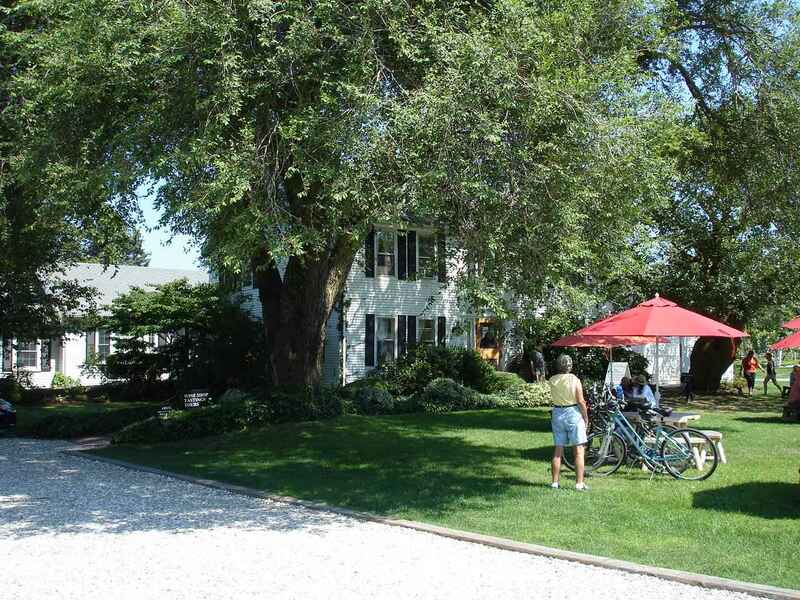 We love the old farmhouse built around 1813. 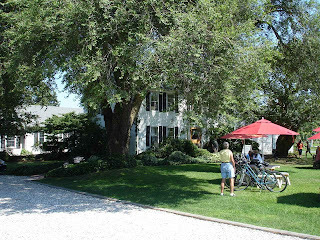 The large tree to the right is supposedly a gift from a sea captain--a Chinese Mulberry-- around 1813. 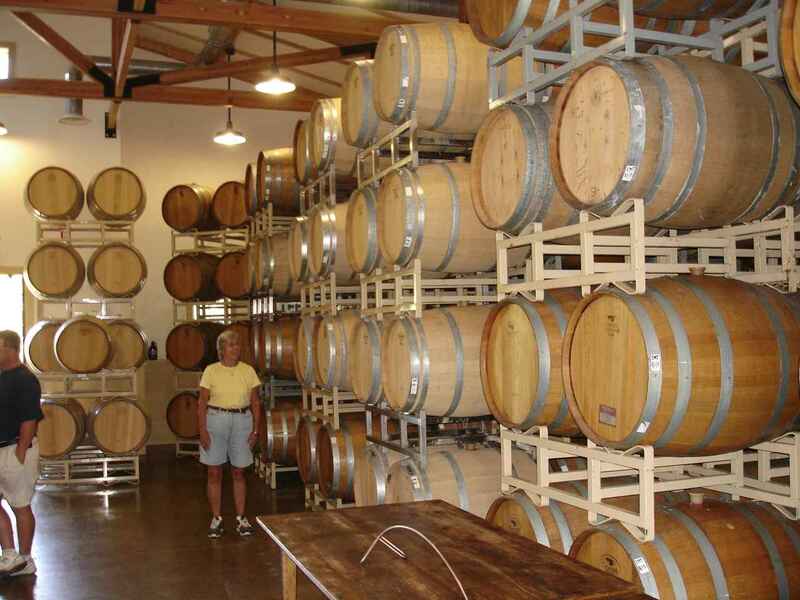 Originally, it was a dairy farm. 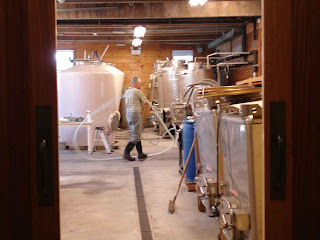 Jan is inside the aging and blending room. 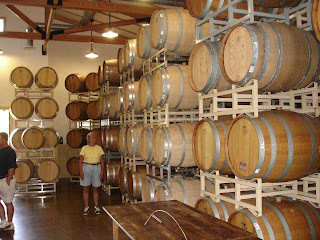 a number of blends of wines.